All our wedding cars are chosen with the client in mind, we put ourselves in your thinking spot and make a decision from there. We take feedback from our clients to find new and innovative ways to improve our service. Ours designated drivers strive to provide excellent customer service to ensure you make an eye-catching entrance to your big day, we strive to deliver nothing but excellence. Rolls Royce Phantom has been the iconic wedding care since the release. 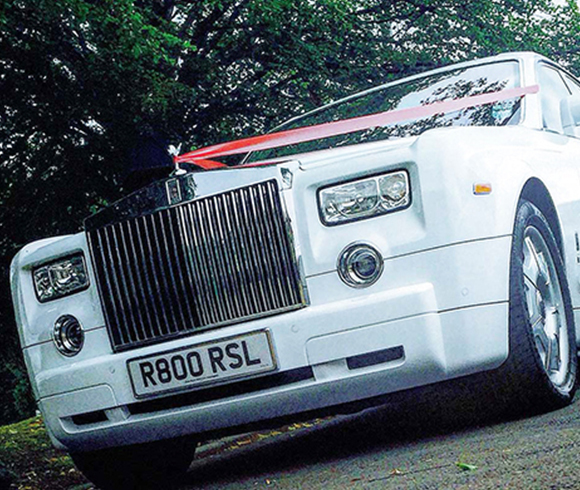 The presence of a Rolls Royce Phantom gives your special day a touch of sparkle. With its elegant design and Stance it makes a stand and shows class. With Excellent cabin space and rear space, the Phantom gives a luxury journey for the Bride and Groom. The Bentley Continental Flying Spur makes a magical wedding car. With plenty of legroom for large wedding dresses, your journey will be relaxed and pleasant. The Bentley Flying Spur will make any wedding day one to remember and cherish. Glamorous and Prestige car our Bentley will give your special day the extra touch and a day to reminisce for years to come.